This map shows how Cape Canaveral is part of, yet detached from Florida. These were the words of a president with a vision and the courage to bring that vision into reality. Unfortunately, Kennedy was not able to personally see his vision come to fruition but despite his Kennedy’s tragic death in 1963. The vision however lived on in Florida with a center bearing his name. We scheduled our visit to Kennedy on our last day of our Florida trip. We only had a 3/4 day due to our flight leaving that same night but we made the best of the day that we had. 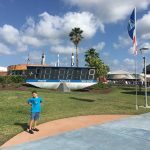 This countdown clock counted down all the Saturn and Apollo missions. Head first to the bus tours as the lines get longer later in the day. 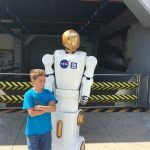 They have some cool robots at the space center. 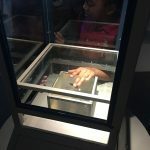 In the Apollo/Saturn building we got to touch a moon rock. In order to do the best we could we decided to rent a car from our Hotel so we could get there as soon as the complex opened. On the way we saw a Waffle House and felt obligated to have a nice breakfast. 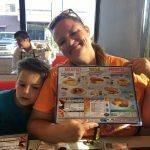 This proved to be a bit of a mistake as the Waffle House was very busy and the waitress we had seemed to have a never ending supply of take out orders that came before us. We did eventually get our breakfast but it put us a bit behind our schedule and we did not get to the Kennedy Space Center until about an hour after they had opened. 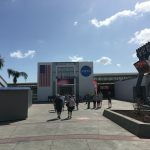 It was a Saturday and the ticket and security lines at the Kennedy Space Center were long. Lots of spring camps in line. We had tickets waiting for us in pre-sale and we decided the best thing we could do was have Denise wait in the security line while AJ and I waited in the pre-sale line. This worked out pretty good because by the time I had gotten through the pre-sale line, Denise was almost upfront at the security line. 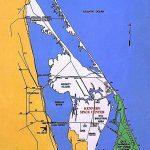 The Kennedy Space Center is a huge complex of over 144,000 acres. 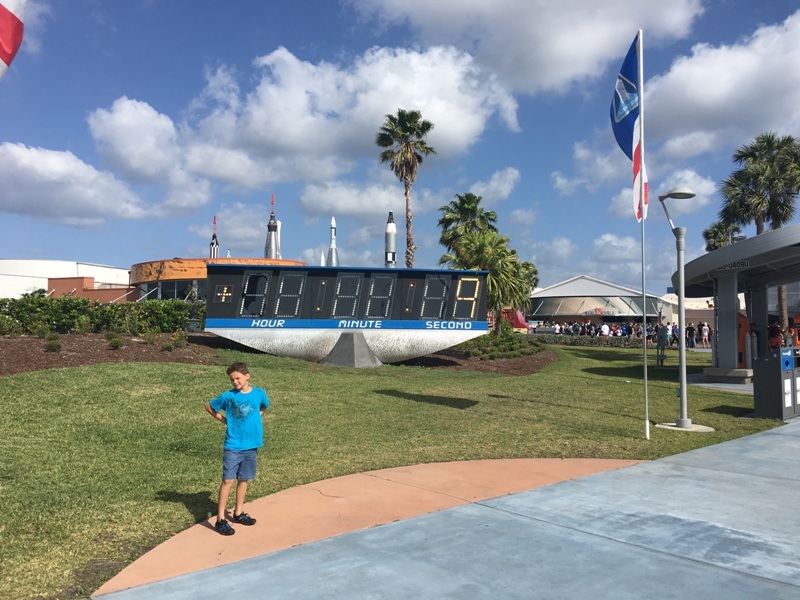 The main part of the center has four different complexes that feature different aspects of space exploration and a rocket garden with many different rockets. 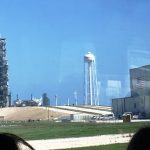 The second part is the launch pads which are only accessible via the bus tours. AJ getting ready for the Shuttle Launch Experience. 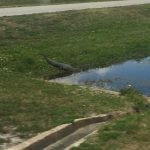 While on the bus tour we saw lots of crocodiles hanging out in the canals that surround the launch pads. 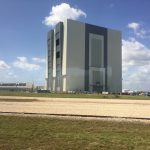 The shuttle assembly building has the largest doors in the world that are over 10 stories high. This photo was taken from behind launch pad B and you can see the assembly building that is 4 miles away from the launch pad. 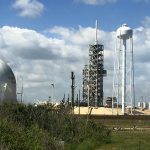 NASA is not currently launching any rockets but Space X has rented the launch pads to develop their Falcon Heavy Rockets. These rockets are designed to bring commercial ventures into space. The Apollo 8 launch control is impressive. What is also impressive is that most smart phones today have more computing power than all the computers in this room, but despite that they got to the moon and back. 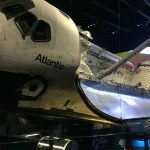 An up close moment with the Atlantis Space Shuttle. Another closeup of the Atlantis Shuttle, the payload arm was developed in Canada. Knowing we had limited time we headed straight to the bus tour. The bus tour is a 90 minute drive (the center is big) and it takes you to several launch pads, the rocket assembly building, and mission control for the Apollo 8 mission. 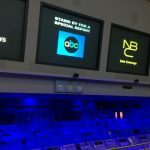 The Apollo 8 control center is an amazing experience that lets you feel what it was like to be there during that historic flight that took the United States out of Earth orbit to the moon and back again. Also, at the Kennedy Space Center is the retired Atlantis space shuttle. 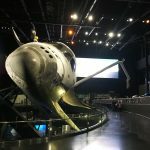 This is a multimedia experience that lets you get up close and personal with the space shuttle. At the Atlantis pavilion we were also able to experience the Shuttle Launch Experience. 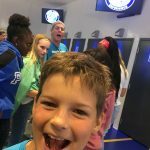 This is an interactive ride that helps you feel what it was like for those astronauts that rode on the Atlantis space shuttle. Unfortunately, we waited a long time to be place with a teenage spring group that were very noisy. It looked like a great experience, but I had to cover my ears due to all the high pitch screams of teenage girls. We had a brief lunch at the center and quickly walked through the rocket garden. There was much more to see but our time was short. In total we probably only saw about half of what there was to see. If we were ever back in the area it would be fun to visit again (sans teenage spring groups). This looks like it was pretty sweet. I’d love to touch a moon rock someday.